Venus, the Egyptian Hathoor, is the ruler of Taurus, while the Moon, the Lunar Flame, is exalted therein. The Thoth Tarot Atu for the 16th path of Taurus on the Tree of Life is The Hierophant V. The esoteric title of the 5th Tarot Key is The Magus of the Eternal. 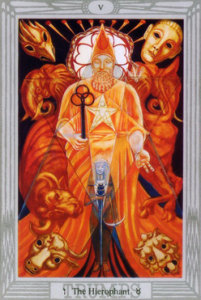 The 16th path of Vav connects Sophia or Chokmah, the sphere of the Zodiac, with Chesed the magnificent or glorious sphere of Jupiter, and is imaged forth by the 5th Tarot key, The Hierophant. The path is called the Triumphant or Eternal Intelligence, since it is the way of return to the Garden of Eden. The Hierophant or Way-shower veils the instruction that is received from the deepest levels of the subconscious, for to hear this ‘voice’ or Word is to commence the glorious return implicit in the path’s title from the Sepher Yetzirah. The descent of the path is aptly figured in the letter vav, where the creative seed or essential fire is carried downwards towards manifestation. Looked at another way, the vav is the head and stem of the phallus (or spinal column), which, in the cosmic sense, is the pillar of the light or consciousness of Aur that stands in the void. The letter’s name means ‘a nail’ or ‘pin’; it is the power of fixing an image in consciousness, an act of will on the level of pure mind. The power of imagining is an attribute of Venus, the planetary ruler of Taurus and the earthly form of Nuit, depicted on the previous 15th path. The Moon is exalted in Taurus and the lunar nature of this path is that it reflects the dark radiance that pours forth from the Ain Soph into the pool of cosmic memory in Chesed, the sphere of Jupiter. As the Way-shower, inner teacher or higher intuition, the Hierophant reminds us that if we follow the Word-vibration back to its source in the infinite, all phenomena cease to exist. The oath of crossing or passing through the Abyss is therefore “to interpret every phenomenon as a particular dealing of God with my soul”. Adepts are then untroubled by the flow of events in space-time, since they instantly recollect that all phenomena are apparitions arising on the dreaming face of the deep. The magical power of the 16th path is the Secret of Physical Strength. The secret bears no relation to athleticism, for it is the knowledge of that which animates all things that live and move and have their being (the Word, Hadit)—it is no less than the secret of life itself. 1. Qabalistic details adapted from The Flaming Sword Sepher Sephiroth [Ordo Astri]. This entry was posted in Astrology, Qabalah, Thoth Tarot and tagged divination, Flaming Sword, magick, occult, prophecy, Qabalah by admin. Bookmark the permalink.